The CPU Meter gadget is my favorite system utility gadget for Windows 7. It's easy to read, responsive, and isn't complicated by a hundred and one options. This Windows gadget displays the status of two major system resources you might want to track on your computer: your CPU and memory usage. If you're looking for a simple and attractive gadget to keep tabs on these basic system resources, add the CPU Meter gadget to your desktop. Note: The CPU Meter gadget is available for Windows Vista in addition to Windows 7. The name of this gadget implies its functionality, and it doesn't disappoint. Getting the CPU Meter gadget on your computer is as simple as dragging it out of Gadget Gallery. Installing the CPU Meter Gadget. Right-click anywhere on the desktop. In Windows Vista, right-click Sidebar. If you don't see Sidebar, find its icon in the notification area by the clock, right-click it, and then click Open. If you're using Windows Vista, click Add Gadgets... instead. Drag CPU Meter onto the desktop. Another option is to right-click the gadget and click Add. If CPU Meter is no longer on your desktop and you want it to be, just follow the steps above. However, if you don't see the gadget listed in Gadget Gallery, then it's been uninstalled for some reason. Microsoft no longer supports gadgets, so you can't download CPU Meter from Microsoft's website. However, Windows has a built-in ability to restore previously uninstalled gadgets. Tip: While Microsoft no longer hosts gadget downloads, you can get CPU monitoring gadgets from other places like Win7Gadgets. 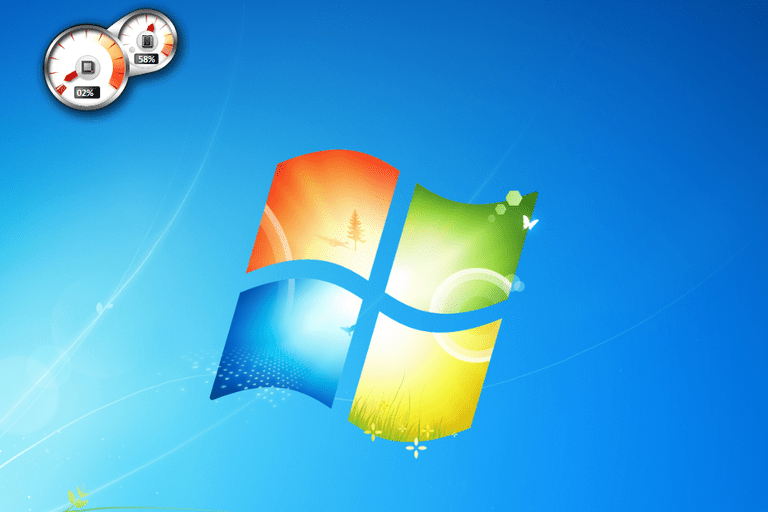 Restoring Windows 7 Desktop Gadgets. Note: Following these steps will reinstall all the default gadgets that came with Windows, but it will not remove any third-party gadgets you installed yourself. Click Restore desktop gadgets installed with Windows. Open Control Panel via the Start menu. Click Restore gadgets installed with Windows. The CPU Meter gadget is a great pick for very obvious reasons — it works well, it looks good, and it's included with Windows 7 and Windows Vista by default. It's the only system utility gadget included with Windows, so it's no surprise that it tracks CPU and memory use. You'd use CPU Meter if you like to keep tabs on your CPU and RAM use. The gadget is valuable in that it shows you in real time whether a program you've just opened or are using right now is utilizing lots of memory and/or processor power. This gadget lets you avoid opening Task Manager just to check system resources when your PC is slow. Just glance over at the CPU Meter gadget on your desktop to see these two stats. Admittedly, it's even fun to just watch the dials go up and down, but it also satisfies that bit of computer geek in all of us. If you want to delete the CPU Meter gadget from Windows 7 or Windows Vista, right-click the gadget from the desktop or Sidebar and click Close gadget. Remember that this doesn't remove the gadget from Gadget Gallery, but instead just closes it down. Reopening CPU Meter is as simple as following the installation steps above.